So, what are the things that you don’t want to freeze overnight? I went through my list… I definitely didn’t want my water bottles to freeze overnight, so I put them inside my sleeping bag with me…. Hmmm…. Things with batteries don’t like to be frozen, so all of my electronic gidgets and gazmos got loaded into my sleeping bag with me…. 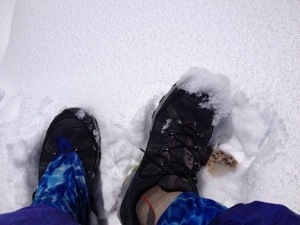 hmmm… Frozen socks, nope, that wouldn’t be fun any fun, so I made room for my wet socks in my sleeping bag with me. My sleeping bag was starting to feel pretty crowded! With temperatures well below freezing and snow coming down outside, the only place I knew that would stay above freezing that night was in my sleeping bag. It would trap my warmth and keep me and the privileged items I decided to sleep with from freezing. I went through my checklist one more time… Electronics, water filter, water bottles, socks… I think those are the things I need to keep from freezing. Since they were all set, I snugged my hat over my ears and prepared to sleep…. Oh yeah, my gloves…. I wanted those to be warm and dry in the morning so they joined me in my sleeping bag too. With electronics, water, water filter, socks, gloves, and now boots in my sleeping bag there was barely enough room for me! (Yes, I always sleep with the big knife in the sleeping bag so I’m not counting it separately here). 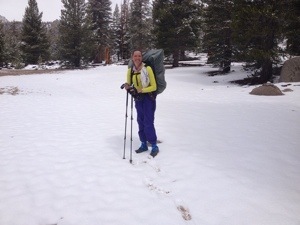 I’m looking forward to warmer temperatures when the only thing in my sleeping bag is me!